My lovely husband went out on a limb at Christmas and took some wild guesses at what I might like for my quilting hobby. He’s been there to see the streams of packages arrive from FQS and eBay sellers, and has witnessed my late night sewing sessions this past year as I really got back into the love of quilting. He did well. He got me two boxes of the Clover Wonder Clips, a couple of jelly rolls, a Fons & Porter large hexagon template/ruler, and a package of Marti Mitchell templates. Amazingly – I did not have any of the items he got me and I’m thrilled with all of them! I was able to put to use the Wonder Clips last night. They worked really well for holding the binding strip in place as I attached it by machine. I did like them better than the hair barette type clips that I have and the Wonder Clips just have a good weight and feel about them. They are pricey, so I had never taken the plunge to invest in them before. But that’s what Christmas gifts are good for – right? In a prior post, I had said that I was making my grandmother a quilted shawl. I thought I was going to use the Swoon pattern, but I changed my mind and went with Flower Girl instead (both by Camille Roskelley). I was able to make the shawl in time, but I didn’t get the binding on before Christmas. I am borrowing it back now to finish it up and will get it back to my grandmother this weekend, all done and ready to party! Notice on the ends of the quilt, the two pockets. They are very oversized, and I think I may whip stitch them closed a little to keep them from gaping open. The intent is for my grandmother to wrap this around her shoulders and be able to keep remote, tissues, etc.. in the pockets while she’s watching TV in bed or her recliner. I can also see this as a bed runner with handy pockets for the same purpose, as long as it is on a queen size bed. This was the first time I had worked with flannel fabric and the minky backing. The backing did fine, although I now want to try the Snuggles (?) fabric from Moda to see the difference. The flannel fabric is not my favorite. My piecing accuracy went waaaaay down on these blocks and luckily, they were large blocks so you can’t tell the flaws as easily. I probably won’t do flannel again anytime soon, unless it is a whole piece for a backing. I’m glad I tried it though! 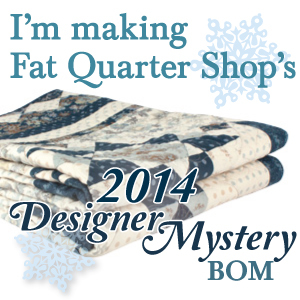 So, I have still done something quilty each day this year and blogged about it. So far, so good.